The name Ridley Cranmer Lattimer suggests three of England’s noble Martyrs. Here it represents a most loyal Primitive Methodist, and not less worthy successor to the Martyrs in his being almost alone in the neighbourhood as a Passive Resister. 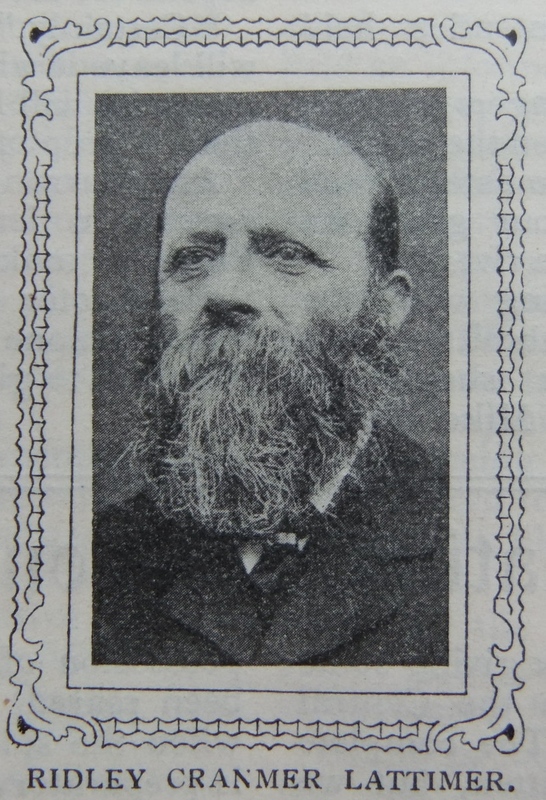 Born at Nenthead in the Alston Circuit, on April 4th, 1847, Mr. Lattimer has spent almost the whole of his life in his native village. His grandparents were among the first converts, when primitive Methodism was introduced into Nenthead, from the Hull Circuit, nearly 90 years ago. They at once opened their home for both travelling and lay preachers, whom they continued to entertain for 65 years. Mr. Lattimer’s father and mother – Thomas and Hannah – were members of our church for 55 years, and kept an open door for the preachers for 40 years at Whiteley Shield in Allendale Circuit. R.C. Lattimer and his excellent wife have more than honoured these early traditions. They have no greater joy than in entertaining the preachers. The present family hold, as a sacred relic of those early days, Johnny Oxtoby’s lantern, left at the grandfather’s on the occasion of that great preacher’s last visit to Nenthead. Mr. Lattimer’s school-days were spent with the Revs. J. Ritson and R. Hind. He was converted at the age of 12, in what is known as Bastow’s revival; and with the exception of a few years apprenticeship in Newcastle, has devoted his life to the Nenthead Society. He is Treasurer to the Trust, and has been Society Steward for 21 years. He is an ideal Steward, with whom any minister feels himself at once at home. Debt burdens, business factions, and social jealousies would be almost unknown if every society were blessed with such a Steward. It is pleasing to note that their only daughter – wife of I.E. Dalton, B.A., B.Sc., of Leeds, and only son Tom, of Kingston, inherit the spirit of their ancestors. Ridley was born at Nenthead to parents Thomas and Hannah. Thomas was a grocer. Census returns identify the following occupations for Ridley. Ridley married Fanny (Frances) Coulson (1852-1924) in late 1876 in the Alston registration district. Census returns identify two children. Ridley died on 13 February 1935 at Nenthead, Cumberland.